The Acts of Hope Charitable Trust provides free nursery, primary and secondary schooling to children living in the urban slums of Bangalore, India. Without Acts of Hope many of these children would face a life of desperation, poverty and exploitation. Acts of Hope have been helping to beat illiteracy and lack of education in India since 2000. The urban poor around Bangalore have no safety nets and their income barely covers food and living costs. Education is expensive. These children have little chance of an education. Acts of Hope offers free teaching for boys and girls age 2-16, including a wide range of subjects such as: English, mathematics, science, technology, physical education, local languages and culture. They prepare for, sit and pass the State Board exams which opens up opportunities for jobs, health opportunity and a happier life. Acts of Hope school support 440 children. There are 18 teachers and 13 classrooms. The charity also purchase the teaching materials, new uniforms, belts, underwear and shoes for the boys and girls. Since June 2016 Acts of Hope has been designated an ‘English Medium School’ meaning all the lessons can be taught in English. Please pray for all those teaching, supporting and learning in the school and that their education may help break the cycle of poverty for the families there. Please pray that they have the resources and support needed for the school. 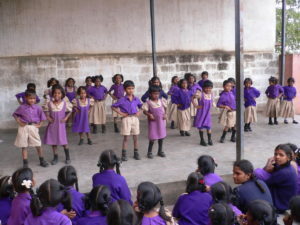 To offer education and a safe learning environment for the children in the Bangalore area. This helps to improve the prospects of the children from the urban poor. On behalf of Acts Of Hope I would like to thank you for your incredible support over the last school year. We have now been helping to beat illiteracy and a lack of education in India since 2000. As you may know, Acts of Hope started as a small kindergarten focused on improving the daily life of poor, sick and malnourished four and five years old children from the slum and beggar villages around Bangalore. Today Acts of Hope boys and girls from the ages of 4 to 16 have access to free teaching across a wide range of subjects including; English, mathematics, science, technology, physical education, local languages and culture. They prepare for, sit and pass the State Board exams which opens up the road to jobs, health opportunity and a happier life. You can read about a few of them in this newsletter. From 16 years onward, The Acts of Hope higher education bursaries give boys and girls who have graduated from AoH and then passed entrance exams, the opportunity to continue on through college and university. Our boys and girls, no matter how poor, regardless of gender caste or religion, are able to make their way in India’s growing economy. The school is registered by the State of Karnataka. The Karnataka Education Department syllabus is taught.Acts of Hope school is three schools in one; Kindergarten, Primary and Secondary school. For the year 2017/18 we have 419 students evenly split between boys and girls. There are 18 teachers and 13 classrooms and things are a bit cramped. P.E. is taught on some waste ground in front of the school. The school purchased the latest issues of the official course books, model papers and mock exams from approved suppliers at the start of the school year in June. We also purchased new uniforms, belts, underwear and shoes for all of the boys and girls. Mrs Clifford, Deputy Head of Maltman’s Green School and her daughter Katie visited Acts of Hope Kasavanahall in July. They took English classes, held seminars for the teachers and visited local villages and homes. Mrs Clifford shared ideas on good teaching practice, safeguarding children, internet and educational technology. We appreciate the planning, the preparation and the resources they took to India. The teaching aids and workbooks have been well received as has been the Maltmans kit . Thankfully, British Airways allowed them increased baggage allowances. Mrs. Clifford and Katie did a snap inspection of the food factory which makes our school lunches. hygienic, well managed and eco friendly. Here are some of the children giving their opinion. 1. Amrutha 81% has been accepted into 1st year at BTL College. 2. Bhoomia 78% has been accepted Reddy College. 3. Kumar 76% has been accepted by Reddy College. This will be second year of the higher education program where we support students who wish to continue their education through Pre-University College (PUC) and then University. Acts of Hope initially raised all the funds in the UK. Now that our students are seen to be successful, we find bursaries are becoming available locally. Acts of Hope has elected to pay the university costs for a small number of AoH graduates based on their passed performance and potential. 1. Monish, final year college 78 % in . 2. Swetha, final year college result 82 %. .
Monish will study for a degree in engineering. Swetha will study for a degree in nursing and Swetha will take a degree course in business studies. We will also award a bursary to an exceptional AoH girl in her second year of university. She would have had to drop out otherwise. Therefore lets wish Monish, Swetha, and Pooja the very best as they work to improve life for themselves and their families. The drop out rate from AoH is very low and the majority of children who start in kindergarten stay at the school through to Standard 10. There is no better example than Sherfun, who came to Acts of Hope aged five. Her mother, brought her and her sister to AoH in the hope of her daughters having a better life. It became obvious that Sherfun was very gifted and one of our donors supported her through primary and secondary school, college and finally university. This year Sherfun has graduated with a first Bachelor of Engineering (BE) and now has her first job as a young professional with theUS company Concentrix. She recently received her first paycheck. This year AoH will be fielding ten runners for the Royal Parks half marathon. This stunning central London half marathon takes in the capital’s world-famous landmarks on closed roads, and four of London’s eight Royal Parks – Hyde Park, The Green Park, St James’s Park and Kensington Gardens. If you are there or are watching on TV please look out for the AoH running vests. We need to thank a few other supporters for their commitment and ongoing support for AoH. Mrs Lee has been our liaison with Maltmans Green for many years. We would like to thank her for her support and help. She has handed over her AoH role to Mrs Edwards, head of geography. We are looking forward to working with Mrs Edwards. We can do a lot with very little as you can see. However, the recent introduction of a sales tax and the fall in the value of sterling against the INR (- 20%) is putting more and more pressure on our resources. We are responding with improving fund raising in India and continuing our efforts in the UK. I hope to continue giving you good news as we move into and through 2018. School Lunches are an important part of the day. School lunches are subsidised by the government and various charities, but still involves high costs. Thanks to a donation by one of our Indian supporters we have been able to upgrade the lunch service. The new meals are a big improvement in quality and nutrition. Many children are malnourished when they first come to AoH. Starting in June they will launch an “Early Childhood Education” program for the two nursery years. This will involve the parents of the younger children. In addition we want pursue phonics in order to get the children reading at an earlier age. As well as students graduating at universities, the school will be offering vocational options in plumbing and nursing. Two AoH student have been enrolled in a twelve week training course with one of India’s leading water management companies. The second is in nursing and a number of options are being opened up by the AoH team.